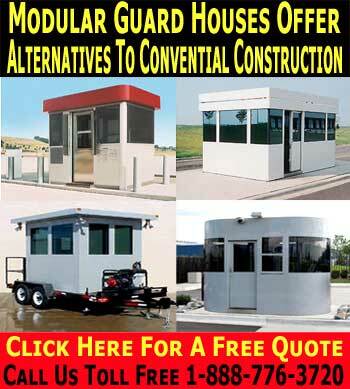 One of the most important requirements for most modern businesses is the protection of their premises, and one simple way in which this goal can be reached is with the use of a number of security guard houses at key entry points so that traffic into and out of your workplace can be properly controlled and monitored. This control over who comes in and out will lead to a massive reduction in the exposure to criminal activity that your business faces, as well as providing a visual deterrent to any unsavory elements who may wish to get in. Easy Rack offer a number of high quality security guard houses that are custom made to meet the exact needs of your business, and can be fully customized in order to fit in with the rest of your premises. 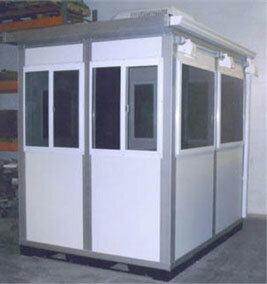 The shelters are delivered in fully constructed form, and are ready to use immediately. They can be ordered with a range of different options such as air conditioning and electrical power, and this allows you to specify the kind of shelter that you need. Depending on the level of security required and also the specific needs that you have for your business in setting up the protection for your premises, there are a number of different security guard houses to choose from. From smaller models designed for use as a shelter by the guard manning the gates through to much more complex security control centers from where staff will be able to monitor cameras and co ordinate all of their activities around the buildings. Making the right choice about which units you require is a difficult decision, however if you have planned through all of the different factors that may impact on the level of security you need, you should have a good idea about what your needs are in terms of the number and design of security guard houses that you should purchase. Easy Rack offer a range of security guard houses that can be delivered to you in fully assembled and ready to use condition. The shelters come with a range of options that you can use to ensure that they meet the exact needs of your staff such as electricity supplies and other amenities. Thanks to high quality manufacturing processes, the components can all be put together at the factory to meet your order so that once the shelter arrives with you, it is immediately ready for use. Only the highest quality components are used throughout the manufacturing process, so no matter which security guard house design or specification you choose, you can be sure that it is built to the highest possible standards and is designed to last. Sizes from relatively small 3’ x 4’ houses through to 8’ x 16’ are available, and these are built from aluminum with a range of different finishes available. In situations where there is additional risk to staff, bullet and explosion resistant designs are available, and this should be considered at the time of ordering. In order to protect your business, you need to protect your staff, and by choosing a high quality security guard house from Easy Rack, you will be able to achieve your goals. Easy Rack carries a wide variety of commercial shelving, material handling equipment, used pallet racks, and modular prefab buildings installed nationwide. 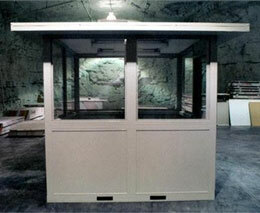 If you can not find what you are looking for call us toll free at 1-888-776-3720 and we will find it for you. Our home office is located in Houston, Texas with warehouses located throughout the United States that enable us to service all 50 states including New Orleans, La., Cleveland, Ohio, Kansas City, Mo., Mesa, Arizona, Virginia Beach, Va., Omaha, Nebraska, Oakland, California, Miami, Florida, Tulsa, Oklahoma, Minneapolis, Minnesota, Colorado Springs, Colorado, Arlington, Texas, Beaumont, Texas, Denton, TX, McKinney, Texas, Midland, TX, Killeen, Texas.